Indian scientist Rajendra Pachauri, who resigned from the world’s foremost body on climate science, oversaw an international effort to highlight the strength of scientists’ conclusions. At the high point of the Indian engineer and economist’s tenure, in 2007, he accepted the Nobel Prize on behalf of the monumental effort to bring together the work of more than 2,000 scientists in readable volumes accepted by governments. The low point, before the allegations that face Pachauri now, came in 2010 when the panel was forced to admit it had included in its assessment an unfounded claim that the Himalayas could melt by 2035. But perhaps the most difficult issues that the IPCC has faced on Pachauri’s watch have been born of its very mission of delivering “policy-relevant” science, while staying out of politics. Last year, because of objections by a group of developing nation governments, the IPCC deleted information from a key summary for policymakers that would have made clear the nations’ growing contribution to the global greenhouse gas burden. Although the data still was included in the IPCC’s bulky full report, scientists objecting to the change came forward both in an open letter and in journal articles to question whether the IPCC process needed reform. Pachauri’s chairmanship began to unravel last week after a 29-year-old female employee at his research institute in Delhi filed allegations of sexual harassment. Pachauri has denied the charges through a spokesman, but said in his resignation letter that “under the current circumstances” he could not provide the strong leadership that the IPCC needs. Pachauri, who was in his second five-year term as chairman, had earlier announced his plans to step down this coming fall, before the IPCC began its next assessment. Over the eight years of his tenure, “Patchy,” as he is almost universally known, was a strong voice for action on climate change, even though the United Nations panel’s charge is not to be “policy-prescriptive.” He consistently urged nations to forge a treaty to mitigate fossil fuel emissions. “If we allow things to continue unchanged and we don’t take action today, it would destabilize human society,” he warned in a 2008 interview with CNN. David Victor, a professor of international relations at the University of California, San Diego, and an IPCC lead author, said that Pachauri should be credited for his steadiness. The assessment released last year, despite the deletions, benefited from his leadership in forging compromises to maintain some of the difficult language on the obligations of different countries, Victor said. Victor, interviewed shortly before Pachauri’s resignation, added that part of Patchy’s legacy at the IPCC will be his effort to bring his own science of economics into the assessments. Pachauri became a target for attacks by those who deny climate science and those who oppose an international treaty. They called for his resignation after the Himalayas incident. 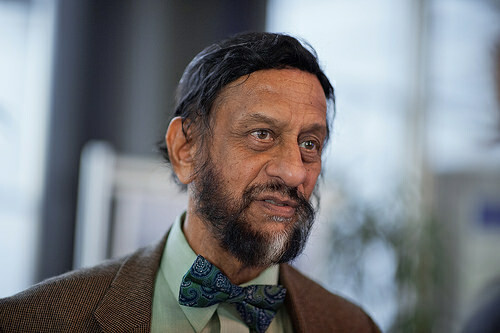 As one of his last official acts as chairman, Pachauri urged that the IPCC venture more boldly into the political realm. In an April 21, 2002 op-ed in The New York Times, former Vice President Al Gore, who would later share the Nobel stage with Pachauri for his advocacy on climate change, raised questions about his appointment. Pachauri, Gore wrote, “is known for his virulent anti-American statements.” In a speech at Vanderbilt University that month, Gore raised concern over Pachauri’s one-time endorsement of a worldwide boycott of American goods and Pachauri’s opposition to developing countries sharing in the reduction of greenhouse gases. A number of IPCC scientists reached in recent days said Pachauri’s personal legal woes should not mar the work of the IPCC. “For me, the IPCC is never about one person,” said Chris Field, founding director of the Carnegie Institution’s Department of Global Ecology, and another IPCC lead author. “It’s about harnessing the wisdom and dedication of the entire scientific community. As one of his last official acts as chairman, Pachauri made some of his own thoughts known, in a “Chairman’s Vision Paper on the Future of the IPCC.” In the document, prepared for the IPCC session that opened in Nairobi today without him, Pachauri urged that the IPCC venture even more boldly into the political realm. In addition to the massive summaries of the science delivered every five to seven years, he urged that the IPCC begin to produce annually “a brief and accurate report.” These reports, he suggested, should indicate how well nations’ official plans for addressing climate change measure up in the effort to keep global warming below the goal of 2 degrees Celsius. The IPCC, Pachauri urged, should keep in mind that its audience is not just governments, but the media, civil society, business, and other stakeholders. “It is important that this is taken into consideration when deciding on the future products of the IPCC, so that the IPCC moves forward with the times and responds to changing expectations,” he wrote. Climate scientists hold starkly differing views on the wisdom of such a course of action. Victor said he couldn’t imagine that such a process would be workable, given the IPCC’s current structure. There would be “large error bars,” indicating a huge range of possibilities. Victor, an IPCC lead author who authored one of the Science articles about the flaws in the current process, said he has come to feel there are realms of important science that are too politically charged for the IPCC to take on, because of the need for government sign-off. Pachauri’s final writings as IPCC chairman were filled his typical rhetorical flourishes about matters both large and small. “For me the protection of planet Earth, the survival of all species, and the sustainability of our ecosystems is more than a mission,” he said in his resignation letter. “It is my religion and my dharma. This article is republished from the Daily Climate, published by Environmental Health Sciences. Read the original article here.